Right whales are found in high concentrations each summer and fall in the Bay of Fundy between New Brunswick and Nova Scotia. The central and deepest portion of the Bay is the Grand Manan Basin. Here, tides and currents concentrate copepods, the preferred food of right whales. In recognition of the importance of this area for right whale feeding, it was designated in 1993 as a Right Whale Conservation Area by Fisheries and Oceans Canada. The right whale conservation area is also transited by large vessels through mandatory shipping lanes. In the mid 1990s, the recognition that vessel collisions with right whales were affecting recovery of the species throughout their range led to the formation of a Canadian working group to address the overlap between right whales and vessels in the Bay of Fundy. Since 1998, Irving Oil has partnered with the New England Aquarium on research, education and conservation efforts to improve the recovery potential of the North Atlantic right whale. 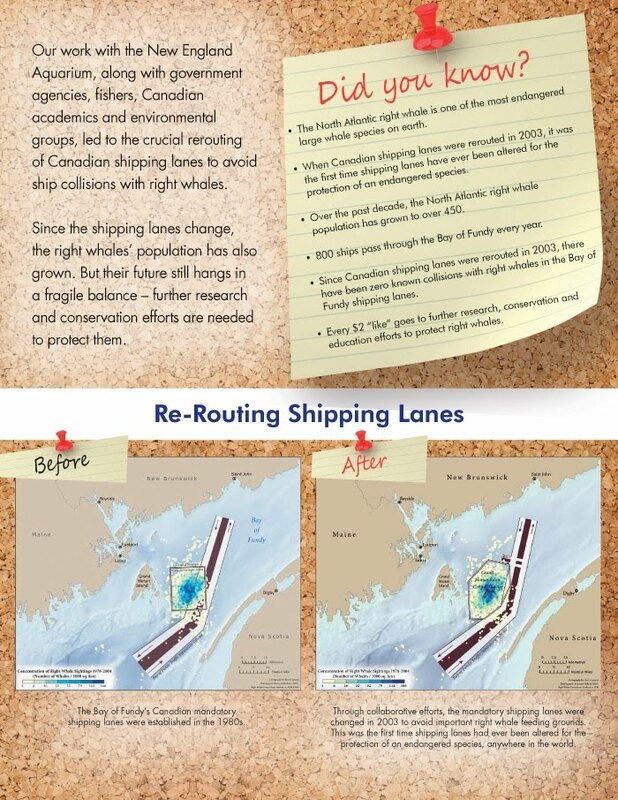 Initially, the company's shipping fleet partnered with the Aquarium Canadian government agencies, fish harvesters, academics at Dalhousie University and environmental groups to develop the justification to reroute the shipping lanes around the right whale feeding grounds in the Bay of Fundy. The re-routeing plan was adopted by the International Maritime Organization (an agency of the United Nations) and implemented by the Government of Canada in 2003 reducing the risk of a vessel collision with a whale in the shipping lanes by 90 percent. Graphic from Irving Oil's facebook page highlighting it's partnership with the New England Aquarium. Since 1998, Irving Oil has contributed annually to the Aquarium's right whale research program in the Bay of Fundy, and continues to be involved in further protection efforts as an active member of the Canadian North Atlantic Right Whale Network. 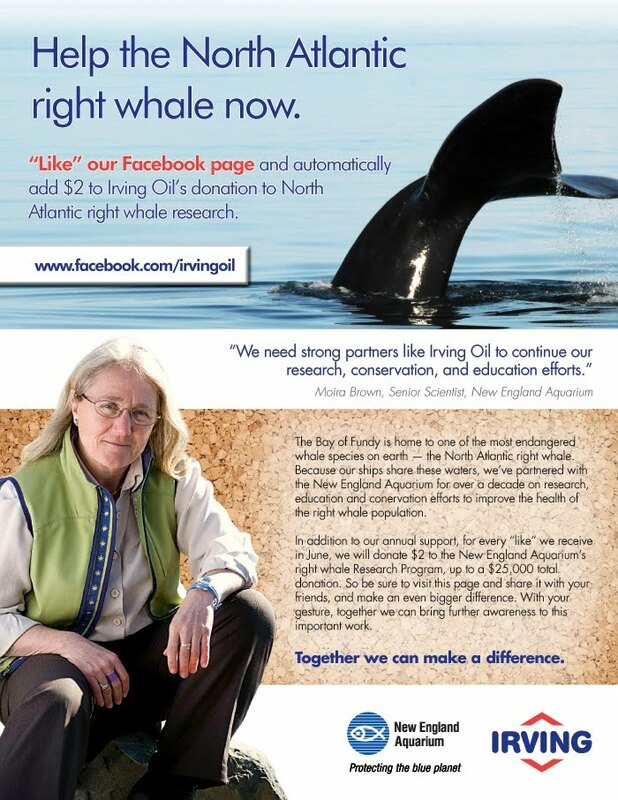 You can help fund our field research program in 2011 by going to Irving Oil's Facebook page and clicking "like" to support our partnership that has led to science-based conservation measures to protect right whales in Canadian waters. Aquarium's Right Whale Research Program.